Having been launched in early 2011, Top Bet has had several years to make their mark in the legal online sports betting arena. They offer a comprehensive sportsbook, casino and mobile app for betting on the go. They are licensed and regulated by the government of Curacao, and are one of the top 10 rated legal USA online sportsbooks available in todays betting market. Their menu of betting lines is solid, their odds are competitive with the Vega oddsmakers, and they offer a great selection of sports categories to bet on. Their banking suite is still developing as far as banking methods go, but the ones offered by Top Bet are among the most convenient. Customer support is adequately knowledgeable and highly responsive, though we would prefer they offer a live chat feature for contacting support services. We found our betting experiences across the board to be enjoyable, technically reliable and very entertaining, with plenty of wagering options and betting lines to choose from. Their live betting features worked smoothly and were user friendly, and their mobile application is well designed and easy to navigate, covering both their sportsbook and casino. Top Bet offers multiple bonuses and promotions to take advantage of, with reasonable wagering requirements and terms. Topbet has one of the best signup bonuses in the industry which includes a 100% matching bonus up to $1,000 on your initial deposit. While other sites offer a bigger dollar amount, the percentage amounts are usually 50% or lower which makes Topbet really attractive to the savvy player who understands how important incentives are for a winning player. Licensing And Certification - Is Topbet Sportsbook Legal For USA Players? TopBet is licensed and regulated by the Government of Curacao. They posses legitimate compliance certifications. This was easy to verify because TopBet is extremely transparent regarding their credentials. They understand that players are looking for legally sanctioned options, and they want to be sure you know that they are indeed legitimately licensed and regulated. They have placed access to their licensing credentials right on their website for you to verify anytime you choose. This brand has exceeded industry standards and minimum licensing requirements in meaningful ways. One example would be their security profile, which includes advanced data encryption technology, firewall and anti virus protection, fraud prevention and the employment of a trained technical team to monitor these systems. Not only is Top Bet operating legally within the industry, they have gone to great lengths to ensure the safety and privacy of your transactions and personal data. You will find a number of bonus offers available at TopBet. Their new customer sign up bonus consists of a 100% match bonus worth up to $1,000 when you make your first deposit. There is also a 10% reload bonus on all subsequent deposits worth up to $250. Everything Thursday is a QuickCash reload bonus of 30%, and if you refer a friend or family member, you will receive a $250 bonus. There are special reload offers extended to bettors as either a 20% or 25% bonus worth up to $200 or $250 respectively. It is also not unheard of to see some seasonal promos based on big events. All in all they do a pretty good job at keeping loyal players happy with ongoing promotions. TopBet's range of betting lines is solid, including both the most popular mainstream sports as well as some of the less popular options. You will find lines on all of the following sports during the applicable seasons: Football (college and NFL), Basketball (college and NBA), Baseball, Hockey, Golf, Rugby, Cricket, MMA, Soccer, Entertainment, Tennis and UEFA. You will have options for live betting and for betting from your smartphone or tablet through their mobile app. Along with an extensive menu of betting lines and odds, you will find a great selection of wagering options at your disposal when visiting Top Bet. One thing we really liked is their section on 'Learning How To Bet'. This area of their website provided explanations and how to information on the various types of wagering options, which can be particularly helpful for those players who are desiring to transition into the more complex advanced sports betting types. Some of the their wagering options include: moneylines, over/under, point spreads, parlays, futures, prop bets, teasers, buying points, prop bets, action reverse bet, if bet, win reverse bet, progressive parlays and more. Betting limits at TopBet are pretty standard. High rollers should contact customer support to discuss limit increases. The menu of deposit methods at the TopBet banking suite is not extensive, however the options that are available are viable for US players. There are four choices for funding your account at TopBet: Bitcoin, Visa, MasterCard and QuickCash. Bitcoin is by far the most popular method and allows for instant deposits and faster withdrawal times. As far as Visa and MasterCard are concerned, Top Bet accepts debit cards, gift cards and credit cards that reflect the Visa or MasterCard logo. QuickCash is an instant money transfer option that is handled through Western Union. This option provides 100% acceptance of USA player transactions. I personally have a lot of success using Visa and MasterCard for online gambling entertainment, however there are times that it simply doesn't work, making QuickCash and Bitcoin the more reliable option. Also, TopBet offers a 30% reload bonus for QuickCash deposits every Thursday. You can withdraw your funds via checks using either regular mail or overnight for a small fee. They've had a few issues regarding slow payouts with checks, but this is not all that uncommon in the industry due to the UIGEA law which makes it difficult for banks to process gambling related transactions. So while we don't like seeing these issues arise, we need to bring it up and it's why we've given them 4 stars instead of 5. Is Topbet Sportsbook Mobile Friendly? Yes, Topbet offers a mobile friendly version of their sportsbook software allowing players on the go to place bets from any smartphone device. Topbet has a good overall customer support team which is available 24/7 via toll free phone or email. We would like to see them offer live chat, but it's not a big deal since they have phone support. First and foremost the site is legitimately licensed and offers a safe and secure betting environment for all of their customers. We found our wagering experience to be optimal with competitive odds and lines, a great range of wagering options, a technically reliable and glitch-free process for selecting and placing your bets, a streamlined and simplified banking suite for both deposit and withdrawing funds, and a more than adequate customer support team. We liked that they utilize the Verified by Visa and MasterCard SecureCode for enhanced security when using these cards. The bonuses are on par for the industry and we found them enticing. The fact that you get a reload bonus every single time you fund your account is a nice touch. The reason we gave them 3 stars is because they had a few player complaints lately about players not getting paid on time. This is actually not all that uncommon, even with the top rated sites as there are always hurdles to overcome in getting USA players paid. In addition, they recently added bitcoin as an option for both deposits and withdrawals which pretty much solved the issue of payment delays. 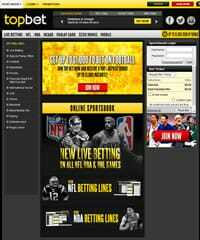 Topbet is a site we consider to be a decent option for USA players. But we do feel there are better choices out there such as Bovada or Betonline.